Tummy time! Some babies love it. Lots of babies hate it. But we all know we have to do it now and then, so here are some ideas to get that baby belly on the floor. 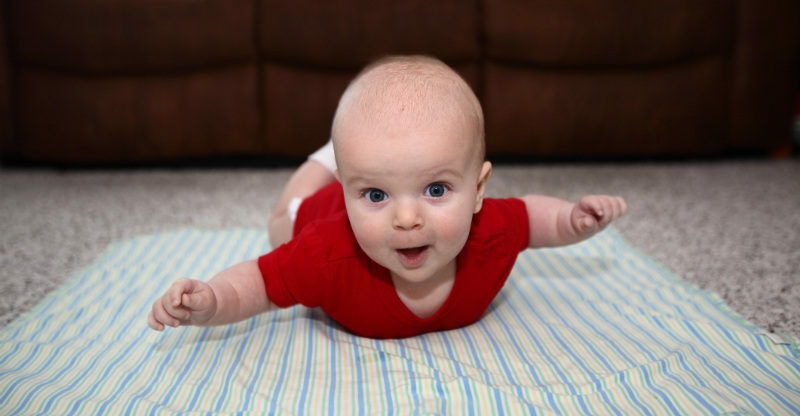 Experts agree that tummy time helps babies build up head, neck and upper body strength. It also encourages babies to reach important developmental milestones like rolling over, sitting up and crawling. Why do some babies hate it? Lots of babies fuss and cry when you put them on their belly. And it makes sense, since our babies don’t spend a lot of time on their tummies anymore. Unlike the old days, when babies often slept on their bellies, we know now it’s safer for babies to sleep on their backs. As a result, babies spend much more time face-up, and understandably find the whole face-down experience rather uncomfortable and demanding. It’s hard work lifting that little head. But rest assured that the tummy-time baby workout is really important for their overall strength and development. How can I help my baby get used to it? Try not to put it off. Starting a bit of daily tummy time soon after birth will make it habitual for both you and your bub. For the first few weeks you could start off with 1-2 minute sessions, a couple times a day. Then as your baby builds up strength, they can do 10-15 minutes a day. Put a few toys, books and safe objects around your baby to keep them entertained while they’re on their bellies. There are lots of great play mats designed just for this, with lights and squeaky things for extra fun. Otherwise, a colourful blanket does just as well. If your baby’s losing interest … fast … try getting down with them to keep them focussed. You could read a book with them, play some games, or just squeeze in a few of your own yoga stretches on the floor. Keep in mind your baby can’t see that much when they’re on their tummies, since they don’t yet have the strength to look around. So just remind them you’re still there with them. Prop up a non-breakable mirror nearby, so your baby can see their own reflection. Shiny reflective toys also do the trick. Guaranteed they’ll get super excited to have another little baby hanging out on the floor with them. You probably have one favourite spot on the living room rug that you come back to day-in and day-out for tummy time. But sometimes just changing the scenery can help – head outside on a blanket for tummy time, or give it a go while you’re out at the park, or a friend’s house. Keep letting your baby know you’re there by talking to them, tickling them, or stroking their hands. Some parents find that a little bit of additional support can make all the difference. For example, you could try putting a rolled up towel or pillow under your baby’s chest, with arms out in front. Even using your lap can give your baby a bit more support and a different perspective. Above all, keep an eye on baby throughout tummy time. Before you know it, they’ll suddenly start using their newly developed muscles and will be rolling and shuffling their way towards more exciting things. By watching your baby, you might also be able to eliminate certain things that upset them. Like maybe their slippery socks are getting in the way, or the floor’s too cold. Keep persevering, and remember that those cries are going to fade as soon as your baby gets their strength and is on the move. How do you cope with tummy time? Tell us your tips!